A MOTION to seek a Brexit extension beyond the scheduled date of March 29 has been passed by British MPs by a majority of 210 votes this evening. The British Government’s amendment was passed by 412 yes votes to 202 no votes in the House of Commons. 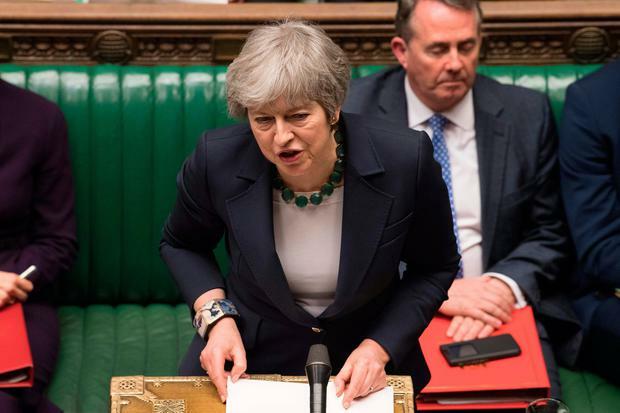 The vote came after British Prime Minister Theresa May’s Withdrawal Agreement was rejected for the second time on Tuesday and MPs voted the following day to rule out a no-deal Brexit. Only a refusal by the leaders of the 27 remaining EU states at a Brussels summit next week could now preserve March 29 as Brexit Day. If MPs approve a divorce deal by March 20, the British government are going to seek from the EU a ‘one-off extension’ until June 30 to pass Brexit legislation. Taoiseach Leo Varadkar has this evening welcomed today’s Westminster vote for an extension to the UK’s departure from the EU. He said: “It reduces the likelihood of a cliff edge, no-deal Brexit on March 29th. “But we now need to hear from London about what purpose an extension would serve and how long it would last. “There seem to be two emerging options: ratification of the withdrawal agreement followed by a short extension into the summer, or a much longer extension that would give the UK time and space to decide what they want to do, including considering options that had been taken off the table like participation in the customs union and single market. “I think we need to be open to any request they make, listen attentively and be generous in our response. “This matter will be now discussed further at next week’s European Council meeting and hopefully we will have more clarity from London in the meantime about their intentions. An earlier motion to extend Article 50 to hold a second referendum was rejected by a majority of 249. 334 MPs votes against the proposal, compared to 85 who favoured it. The Labour Party’s Amendment E, calling for Mrs May to use a delay to give parliament time “to find a majority for a different approach” was defeated by 318 votes to 302. A subsequent motion to delay Brexit until June 30 to find a way forward with a majority of support in the House of Commons has also been defeated by a majority of three votes. The amendment was rejected in the House of Commons by 314 no votes to 311 yes votes. A proposal by lawmaker Hilary Benn which would take control of the parliamentary agenda on March 20 with the aim of forcing a discussion of Brexit options at a later date was also defeated by a 314 to 312 majority. Taoiseach Leo Varadkar said he welcomed the House of Commons vote for an extension “as it reduces the likelihood of a cliff edge, no-deal Brexit”. “But we now need to hear from London about what purpose an extension would serve and how long it would last. There seem to be two emerging options: ratification of the withdrawal agreement followed by a short extension into the summer, or a much longer extension that would give the UK time and space to decide what they want to do, including considering options that had been taken off the table like participation in the customs union and single market. US President Donald trump has also criticised British Prime Minister Theresa May’s handling of Brexit negotiations. Speaking as he met with Taoiseach Leo Varadkar in the White House this afternoon, he said he will stay out of Britain’s Brexit negotiations but say Mrs May did not listen to his advice on the matter. Mr Trump said: “I’m surprised how badly it’s all gone from the standpoint of negotiations. Led by Independent Group lawmaker Sarah Wollaston, this amendment would have instructed the government to request a delay to Brexit to allow time to hold a second referendum. A technical change to add a time limit to Amendment I which seeks to pave the way for indicative votes in parliament on Brexit options. Led by lawmaker Hilary Benn, a cross-party group have put forward a proposal which would take control of the parliamentary agenda on March 20 with the aim of forcing a discussion of Brexit options at a later date. This process, which would overturn the usual rule that the government controls what is discussed in parliament, is aimed at trying to find a majority for an alternative Brexit path that would break the parliamentary deadlock. Jeremy Corbyn’s opposition Labour Party has submitted an amendment calling for May to use a Brexit delay to give parliament time “to find a majority for a different approach”. 1) Notes parliament has rejected May’s deal and a no-deal scenario, and agrees the government will seek an extension to the Brexit negotiating period, which currently ends on March 29. 2) Parliament agrees that if lawmakers approve a divorce deal by March 20, the government will seek to agree “a one-off extension” until June 30 to pass legislation needed to smooth Britain’s departure from the EU. 3) Parliament notes if it has not approved a divorce deal by March 20, then it is “highly likely that the European Council at its meeting the following day would require a clear purpose for any extension, not least to determine its length, and that any extension beyond 30 June 2019 would require the United Kingdom to hold European Parliament elections in May 2019”. This amendment, submitted by Labour lawmaker Chris Bryant, seeks to prohibit the government from asking parliament to vote on May’s exit deal for a third time, citing parliamentary convention that the same question should not be asked of lawmakers more than once.